RFG, which is responsible for numerous quick service food outlets in Australia, is now forecasting it will achieve a net profit after tax 15 per cent higher than what it achieved last financial year. RFG had previously forecasted a net profit after tax 20 per cent higher than its 2016 financial year. 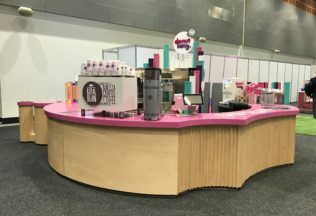 In an Australian Securities Exchange (ASX) update, RFG said one of its chains, Michel’s Patisserie has experienced supply chain issues driving down its profits. Advances on marketing funds made to Michel’s Patisserie and RFG’s Pizza Capers, are also not expected to be recovered with less of their stores now open. At the start of June 2017, RFG shares dropped by 11 per cent after a UBS report said a new accounting standard may negatively impact RFG’s balance sheet. RFG criticised the report saying UBS would have “no insight” into the impact of the new accounting standard on RFG. A US food testing laboratory has explained what America’s new nutrition panels will look like. Coca Cola Amatil has launched a Mount Franklin flavoured sparkling water range packaged in cans. SPC is marking 100 years in business in 2018 with a new television advertisement.